If You Know Their History: Celtic fans "fought running battles, wrecked toilets and urinated in public areas"
Celtic fans "fought running battles, wrecked toilets and urinated in public areas"
DUNDEE security chief Jim Thomson last night told how staff were PETRIFIED as drunken Celtic fans ran amok at Dens Park. Operations manager Thomson was left disgusted as visiting fans fought running battles, wrecked toilets and urinated in public areas. 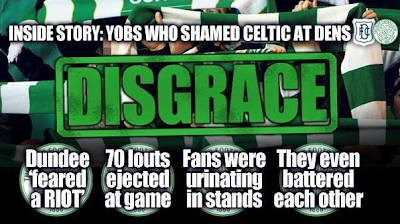 Celtic have slammed the thugs and called for decent supporters to root them out. Five people were arrested but that total is expected to rise sharply when police study CCTV footage to identify the troublemakers, with up to 200 believed to have been involved in the shocking scenes. SunSport understands more than 70 Celtic fans were ejected from the ground as police battled to stop things escalating into a full-scale riot. The clubs are now waiting to see if SPL match delegate Tom Purdie includes the incidents in his report. If so, Celtic could be hit with a hefty punishment. Long-serving Thomson, who likened what he saw to the dark days of 1970s football hooliganism, believes booze played a major factor and slammed the decision to stage the game at 7.30pm on Boxing Day. Many supporters travelled to Dundee early and were in local pubs from lunchtime onwards. The Dens official branded the disturbances as the worst he’s seen from any supporters. He said: “In the 20 years I have been running games at Dens Park, I have never seen anything like the behaviour of the Celtic fans. “It was not just a small minority to blame. There was almost a full-scale riot. My staff were genuinely at risk. I had female turnstile operators coming to me visibly shaking. “The situation was almost unmanageable. I have never seen so many people drunk. “Our fans were abused, our stewards were abused and no doubt the police were abused. “You could not send a steward in to sort it out as you never know what might have happened. “I’m not pulling any punches here. I did not feel safe. “It was like a throwback to the 1970s. It really was scary. The away fans had no respect for their surroundings. They were basically doing the toilet where they stood. “I had Celtic fans telling me they were embarrassed by their own fans’ behaviour and the state they were in. “I stopped counting at 40 ejections from the Bob Shankly stand where all the trouble was. Thomson also revealed that the toilets were left in such a state that it took a team of cleaners hours to get them back into a decent state. With so many drunks attempting to get into the ground, Dundee feared there would be trouble. Thomson insists refusing them entry was a bigger risk because there was a real fear of sparking a riot outside. He revealed: “There were so many drunk people outside that we just had to let them in. “If we didn’t, there would have been a riot outside. It’s as simple as that. In the end the police decided to contain the out-of-control supporters in their section, with Thomson comparing it to the ‘kettling’ tactics police employ at many games across Europe. He said: “It was like a continental-style policing operation. Dundee have received complaints from fans who feared for the safety of kids they had taken to the game. They believe the authorities blundered by allowing TV to schedule the match for the evening of a public holiday. Thomson said: “The game should never have kicked off at 7.30pm on Boxing Day. “It was a disaster waiting to happen. It gave the supporters too much time to get drunk. It’s just a joke to play a game at that time on that day. “Everyone knows this time was chosen to fit in with the TV schedule but the atmosphere at the game was just frightening. “That was meant to be the Celtic v Rangers game as we got Rangers’ place in the SPL. A Tayside Police spokesman said: “There was a level of disturbance at the match, primarily within the Celtic section of support.